Perform Fit gizmo operation on UVW mapping modifier on all selected objects. PLEASE READ THIS CAREFULLY BEFORE ASK WHATEVER! (and this is the PURPOSE OF THIS SCRIPT)! and AUTOMATIZE the Fit operation on multiple UVWmaps. applying UNIQUE modifier to EACH object. So NOT expect an instance UVWmap modifier to do miracles. THEN we do not ever need to wrote any script. Well, this is an essential, common knowledge of Max. then just ask in the forum instead. Submitted by Anubis on Thu, 2011-12-15 14:08. Well, as I see, you intend to integrate the functionality of my script to your own script (which has some setup before uvw fit operation). So, whats do my script though? Its NOT create OR apply UVW modifiers, ONLY perform Fit operation on Existing UVW Map modifiers. In other words, make sure your script WAS applied Unique UVWmaps to each object. Else, you know, no way 1 instance mod to fit to multiple objects, right? To integrate my code to your script, you need to copy all 3 functions inside - UVWMapModFit (main function) + isModOnNode & getModIndex. And at the end of my code you can see how I call my main function on each selected object: for obj in selection do UVWMapModFit obj. Submitted by danieljhatton on Thu, 2011-12-15 12:23. What I wanted to do with this script is create a large number of windows. Use the detach poly script. Center all pivots to each individual pane of glass, THEN, apply a Uvw map to everything at once, make said Uvw map unique in respect of everything, THEN hit uvw fit. I presumed this would apply a Uvw fit unique to each object, but what it does is apply one Uvw map in the middle of everything, not unique to each object. Submitted by othoap on Wed, 2011-09-21 09:46. My original need was to APPLY fitted UVWmaps to a selected group of objects at one time. Max applies the maps to a group but dose not fit them to each individual object. This maybe confusing to people who don't know this project started on a different thread. Submitted by Anubis on Tue, 2011-09-20 14:16. 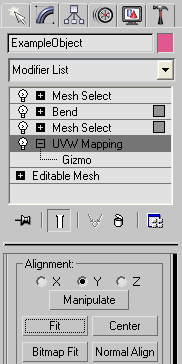 As title and description say - the script only refit the gizmo on existing UVWmap's (not apply new modifiers). When add new UVWmap's you not need those script because they're auto fitted. Submitted by othoap on Tue, 2011-09-20 11:05. Sorry just not getting it. Are you saying add the UVWmap to each box one at a time? Then if the map get out of wack you can select mutiple objects that all have gismo and your script will refit them? "Fit the UVW Mapping Gizmo" is meant to work on refitting not apply the UVWmap to a group? Submitted by Anubis on Mon, 2011-09-19 23:07. P.S. - When we add UVWmap it zigmo auto-fit, but if you change #maptype or #axis of the mod after applying, you'll need to press Fit button and this is the task that current script automatize. Submitted by othoap on Mon, 2011-09-19 15:52. -Ran "Fit the UVW Mapping Gizmo"
Result - The UVWmaps were resized and placed between the two box's. Guess I'm doing it wrong.